"Oops," Bono said. "I'm sorry about that." 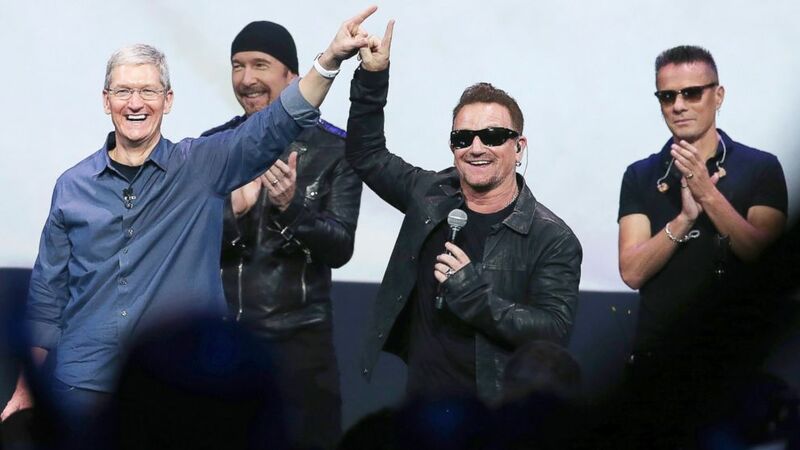 camera (Justin Sullivan/Getty Images) Apple CEO Tim Cook, left, greets the crowd with U2 during an Apple special event at the Flint Center for the Performing Arts, Sept. 9, 2014, in Cupertino, California. During a Facebook chat on Tuesday, the four members of U2 addressed the free album they released last month for all iTunes users. "Songs of Innocence" was given to all iTunes members, a half a billion people, after the big iPhone 6 announcement on Sept. 9. Many Apple users got a little angry that they were force fed the album, especially with it taking up memory on their phone. One fan asked Tuesday, "Can you please never release an album on iTunes that automatically downloads to peoples playlists ever again? It's really rude." "Oops," U2 frontman Bono responded. "I'm sorry about that. This beautiful idea, we kind of got carried away with it." He continued, "Artists are prone to that kind of thing. Drop of megalomania, touch of generosity, dash of self promotion and deep fear that these songs that we poured our life into over the last few years might not be heard. There's a lot of noise out there. I guess we got a little noisy ourselves to get through it." During the September announcement, Apple CEO Tim Cook said, "If you are not an iTunes customer, sign up now and get the album." This is the "largest album release of all time," Cooked added. "It's gonna sound absolutely fantastic on your iPhone 6."